Don’t’ make the mistake of buying libraries in the demo version. Do not make the mistake of buying libraries in the demo version, when you upgrade to the full version you will have to buy them again, a complete theft, and if you contact the customer service. they tell you to report in the apple store, do not lose your money. This version (2.0.9) works pretty well, I have no real complaints about its function, although AU3 would be a nice addition. My primary concern is about the pop-up window that comes up at launch (which covers the top 1/3 of the screen) that tries to get you to in-app purchase the Miroslav Symphony Pack... it interferes with an Audiobus set-up until you go back into SampleTank and close the pop-up. Also, and this is an important point, if you don't touch the tiny little "x" just right SampleTank tries to execute the purchase. I accidentally had my finger on my touch-ID home button and ended up buying the pack for $30! (I got a refund...) That's just crazy... either that's very poor interface design, or it's an aggressive attempt to force a purchase. BEWARE! I am pleased with the samples in this app there very good. But they keep having an ad for their new product popping up and it is hard to get rid of you press the X and it goes to the website for their new app. After about 3 or 4 times of pressing on the X it finally stops going to their website. I paid to much for this app to have an add pop up. I will never buy anymore of there products if there going to continue to bombard me with new product ads. Shame on IK Multimedia. This is not the experience I should have after spending as much money as I did on this iOS software. Now I’m going to go and find the receipt of my purchase and contact Apple for my money back. Unbelievable!!!! works well. the sounds of the expansions are worth the price. when theyre half off $. the pianos offered are substandard. the drum demos wont play in the "shop" menu of the app. and there are no demos on your site to hear. this app has gone up and down in stability. its not cheap. for now its simply the only real multi timbral sampler option. the miraslov orchestra 2 is amazing. 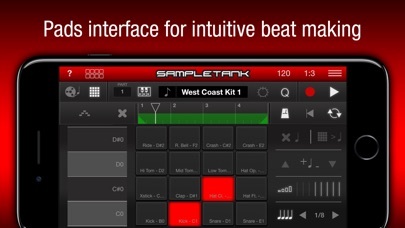 and when its half off, highly recommended and worth getting sampletank for, on its own. works incrediblywell in conjunction with isymphonic... the pianos in the miraslov, however, are the worst on the market. easily, the worst. everything else is top notch. don't buy it for the pianos. the stock sounds are average. you need to expand and have space to get its max potential. it'll cost you fifty bucks to do it right. if you know what an "eps16+" is you'll be right at home. Get with it, IK! No ones gonna buy anything unless it can be loaded as AU. I have a few sound packs, but I’m gonna hold off buying more till the app is updated. In response to dev: I think you’re blowing smoke. I heard that you were “looking into” updating to AU back in August. It’s now December, and still no solid commitment. Most of the iOS music community will agree with me on this: if it ain’t AU, I’m simply not going to buy it. Not satisfied with sample quality. I purchased SampleTank based on reviews and YouTube video demonstrations. However, after installing and purchasing the full default instrument set;I am disappointed with the quality of all the samples i've heard in this app. In a word, unrefined. The audio noob may not detect the difference, but the well-seasoned musician will hear it immediately. There is a lot of noise in these samples; meaning the actual true sound has not been well-isolated in the recording method. *iOS music creators are looking for instrument samples and patches of extraordinary quality and uniqueness. While SampleTank has a lot of different functions, unfortunately (in my opinion) it does none of them well. I would advise the developer to greatly increase the sample quality and usability of the app. 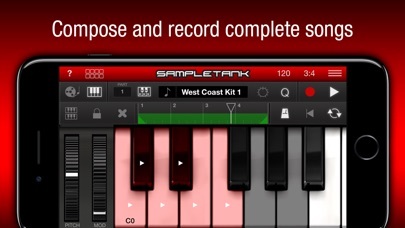 SampleTank competes directly with GarageBand and Korg Gadget. That is a daunting task indeed, for both of those softwares have nailed the sound quality aspect. Garbage in / Garbage out. You touch any controls including volume, pan, transpose and any of the knobs above the keyboard and it instantly crashes. From guitars, to orchestras, pianos, synths, percussion, voices. Links nicely with Cubasis, both midi and audio, and Audiobus. Lots of patterns associated with the sounds. Finally, they fixed the ios 12 bugs. A lot of these sounds are just chords and cutoff changed which you could do yourself so your really not getting that many different organs. Other than that I would have gave it 5 stars. I use a Fishman Triple Play on a strat sounds track nicely. You must bring back the former version of sample tank for people like me that does not have an iPad Pro. There are a lot of people angry for what you did. I would not doubt a possible class action lawsuit if this is not corrected. It has been a little over a month since the iOS 12 update came out, and in that time period they have already offered two improvements to the operating system; yet IK Multimedia hasn’t offered any solutions to the glitches and app crashes that are occurring as a result of these updates, leaving customers who use this app frequently feeling disappointed. The upgrade seems that it has more to do sell expensive in app purchase sounds not listed here. It might just be me but does this app have problems for an iPhone? Mine keeps force closing. Pretty upsetting for the amount I paid for it. So you can get the free sample tank and buy the 40 dollar sound pack? I just spent 20 on the paid version and now I have to spend 40 more to get all of the sounds that I could have gotten for 40 with the free app? This needs to be clarified. SampleTank crashes when trying to use the knobs to modify a sound parameter. I love the app and use it all the time, but need the crash fixed please! It crashes every time I touch a knob. I see several others with the same complaint. For now, this app is broken. When it works, the sounds are decent, but nearing the end of 2018 still without AU support is a pretty big let down. Its just not worth it since you probably won’t be using Sample Tank in much of your work. I don’t have much faith in IK to keep up any more. I have used SampleTank for live performances for over 3 years. I'm very dissapinted with the delay introduced in new version when switching patches(now called multi) which takes 1-2 second to switch with cracking noises even in "ultra low" latency mode making it unusable in live performance situations. Please bring back the lightweight of patches and quick change between patches!!!! Bought the app based on YouTube review, that you can layer instruments just to find out it's not working. Please fix it. This package is not as described. When a company like this offers you somthing that appears to be a combo of three separate softwares and then gives you limited versions I call it fraud. The description and price should reflect that the piano and rhodes are limited free versions and that Sample Tank itslef only has about 30% of the sounds one would expect when purchasing the full version. Its defintiely not a deal. Very dissapointed. This used to be my favorite synth app but now it keeps crashing any time you try and move any of the on screen controls so now it’s worthless, glad I’ve only been using the free version and didn’t waste money on adding additional sounds, there’s enough free soft synths out there so goodbye IK Multimedia. As soon as I tap a knob (volume, pan etc) the app crashes. Decided to do a full wipe since there was a major update anyway, and I have the exact same results. The Crashes render it inoperable. Not waster your money on demo version. Not investing anymore into the hype of SampleTank. Spent $20 for the base app which was "okay" but far from inspiring. So, I spent another $40 to buy the ALL SOUND PACKS. First- beware that you will still have sounds "greyed out" because when you buy All Sound Packs, you apparently aren't actually getting all of the sounds listed in the base app. Second- be prepared to be under-whelmed by pretty bad samples that quite frankly...well, just don't sound like something that is worth $60. The only thing I really am happy with is the interface. It is intuitive and user friendly. Unfortunately, at this point (based on my experience with this app, and their guitar apps) It really seems like they try to reel you in, to get you to spend more $$$$ on in-app-purchases, only to be left feeling like you didn't get the "amazing sample library" you were sold. If I could return it, I probably would. I took a chance on SampleTank, and ended up also buying the app's "full sound pack" for $20, which, it turns out, isn't the full sound pack at all. To have all the nicest sounds, one could easily spend over $100. As it stands now, of the sound pack I did purchase, there are fewer than 20 that are worth even playing. And the string/orchestra sounds (without spending an extra $54) are mostly quite terrible, with the exception of the harp, which is quite pretty. Not an app I'm pleased with in the slightest. First time I've spent this much on a iOS sound source app that I found really very weak. IK apps have some of the best sounds out there but without AU support I’m unable to use them in all the cool ways I could with some midi compatibility. When IK gets with the modern times there is so much money to be made because I, for one, would then be interested in their complete catalog of sounds on multiple apps. I'm a long-time Sampletank user. I've tried using Sampletank with a keyboard splitter (Midiflow Splitter for Audiobus 3), but there are two issues that present... 1.) 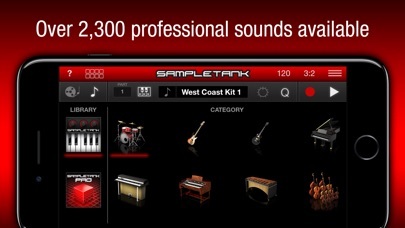 Sampletank isn't using the latest SDK for Audiobus 3 2.) Sampletank sends midi notes twice, once on a channel being bussed to a destination, and once again simultaneously to CoreMIDI. Unfortunately, the CoreMIDI signal can't seem to be disabled in Settings, so Sampletank ends up playing notes outside of a defined zone on a keyboard. This is actually a known issue, but I haven't seen anything from IK Multimedia acknowledging or addressing it. So, while I have this wonderful library of sampled instruments, I can't split it on a keyboard for live performance, at least not with the Audiobus / Midiflow solution. I'm hoping this will be addressed in an upcoming update, or perhaps once AUv3 functionality is incorporated that a single instance of a Sampletank instrument will adhere to zoned keyboard play. ----- prior review, 4/30/18 ----- This version (2.0.9) works pretty well, I have no real complaints about its function, although AU3 would be a nice addition. My primary concern is about the pop-up window that comes up at launch (which covers the top 1/3 of the screen) that tries to get you to in-app purchase the Miroslav Symphony Pack... it interferes with an Audiobus set-up until you go back into SampleTank and close the pop-up. Also, and this is an important point, if you don't touch the tiny little "x" just right SampleTank tries to execute the purchase. I accidentally had my finger on my touch-ID home button and ended up buying the pack for $30! (I got a refund...) That's just crazy... either that's very poor interface design, or it's an aggressive attempt to force a purchase. BEWARE! If you have an Ipad 2 then the update from IK Multimedia to a 64 bit version of this app renders it incompatible with 32 bit devices such as Ipad 2. If you updated the app and no longer have the old version then you are out of luck!! For someone who made multiple in app purchases with the previous version of this app this is akin to a bait and switch!! Can’t make any edits or adjustments without it crashing. Trying to implement a mobile sketch studio using Cubasis and SampleTank. Trying to use SampleTank because it seems to have the best sounds for a basic orch template. But, like another review stated, the integration is a mess. Audio Units compatibility would be a dream. It’s useless as a real mobile DAW on it’s own. Wish ST could integrate like Kontakt does in full DAWs. Actually wish Kontakt had an iOS ver but... Saving the worse for last. I finally came up with a useable template utilizing “AudioBus” only to find that Cubasis mixer does not control ST and of course when I attempt to adjust channel vol in ST it crashes. Known, killer bug that is a over a month old with no fix available. However, even after purchasing the full version, not all the sounds are unlocked. At least have the full sound packs for the basics already available, while charging for the expansion sound packs. There's a good $100+ dollars in in app purchases. A great app with phenomenal sound quality. But It feels like you are paying $11.99 for nothing but a demo app which I thought this was, until I seen that the full version was purchased by younger ones mistakenly. Crashes every time I use it. If you try adjust the parameters it crashes. Not au support. You to great to be lacking so much. Update the apps and show your customers you take your product serious. You get 0 stars. No audio unit support. Pretty much unusable, keeps crashing on iPad. I personally preferred the older, 2015-16, Sampletank layout. It was very straightforward- here’s your loops, pick a key, tempo, etc. and go. From there I could easily record, sample, rework, and use the loops however I pleased; that version/edition of Sampletank was wonderfully effective for those purposes. Now unfortunately, with the latest version, I can’t even figure out how to hit play on Sampletank- actually I’m not sure if there even is a play button on Sampletank. So thanks a lot to everyone who complained about the layout, midi capabilities, etc. thanks to you, some of us can’t even use this app anymore. It would be really great if designers could make this whole new “live mode” twist, etc. optional or something. Honestly, if I could I’d just download the older version of this app (is there a way to do that??) Or can the designers modify the Help stuff so that it shows you how to just play the loops and samples? I bought a bunch of the sound packs back in 2016. So I’m pretty bummed that now I can’t use them, and potentially kind of wasted my money. I’m really hoping that somewhere down the line this app becomes easy to understand again so that way I can get back to making the different tunes I was working on. That all being said though the sound quality on Sampletank is really good. And the way you could (or maybe can) play with the different loops and sounds in my experiences lent itself to a really fast, economic approach with songwriting/constructing cool beats, sounds, etc. to then jam out, have fun, and enjoy music. Might be good but the app crashes if I try to turn a knob. I haven't tested yet so I'm leaving it at 3 until I try it out. However, I am glad that IK Multimedia has reversed it's very stupid decision to abandon its older users. That would have been the last straw that lost me as a customer. 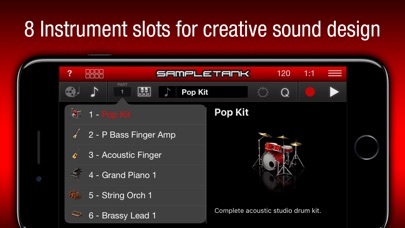 I'm glad to see that older iOS users can once again use SampleTank. Kudos for not ripping us off. Thanks! Some of the best synths and samples out there for iOS but they make them SO hard to actually incorporate into anything you are working on. Please please please add background audio support, AU, let Sampletank play well with others via midi. I’ve spent well over $100 on samples and loops here that I can’t use with my iOS DAW. 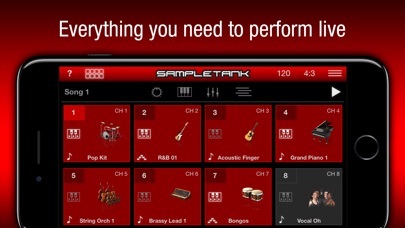 If AUM, MODSTEP, AURIA PRO, BeatMaker 3, BeatHawk, OR CUBASIS 2 or any other iOS daw for that matter can utilize sampletank please contact me as I would love to give this app 5 stars. As is- I’m afraid the Devs are mostly done with it and just riding on easy street these day. The orchestral instruments are unmatched in iOS. I am with everyone else when they request that SampleTank be more friendly with DAWs like Auria Pro and Cubasis. I would also love to see you come out with some better quality choir samples. Keep up the good work!